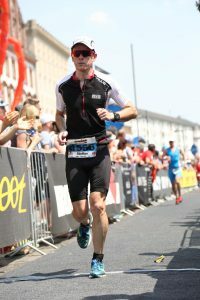 Steffan Ford Blog - Triathlete, Ironman, Runner Steffan Ford – Triathlete – Blog about the ramblings of an Triathelete, Ironman, Cyclist, Runner, Swimmer and Family Man. Blog about the ramblings of an Triathelete, Ironman, Cyclist, Runner, Swimmer and Family Man. Every year that time comes to run the Corporate Challange race. I enjoy the race as it is a good opportunity to socialise with fellow colleagues at my organisation. After returning from a training camp in St Moritz it was a good opportunity to identify my fitness prior to Ironman UK. My initial issue was I forgot my watch for the race and would have to run on feel. I choose to follow a colleague in the race that was running very well recently. I hang on and at 2km he just wasn’t feeling in the zone. I was easy and pushed on, as I reached the 5km point I realised I was under my 5km pace and thought a little push should nail a good time. 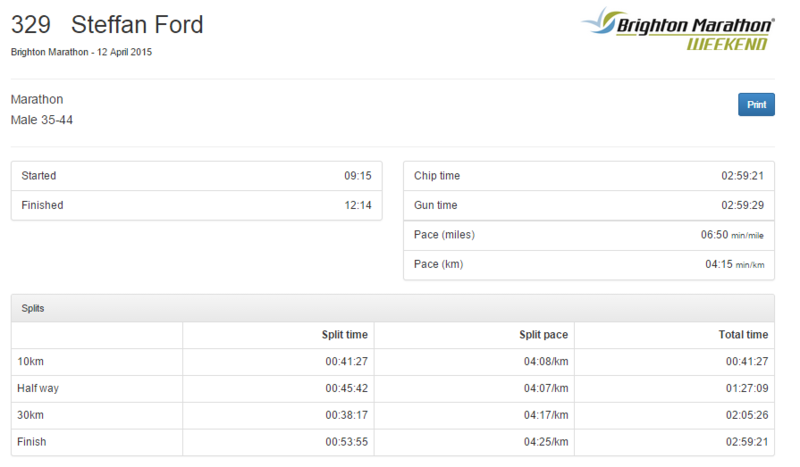 I finished in a PB of 19:28 (3:28min/km) and who said going to V40 would be the start of a downward turn in times. The Year plan for 2017 was based around my wife’s 40th birthday. I wanted to return to Frankfurt but decided to race in the U.K. For Ironman. 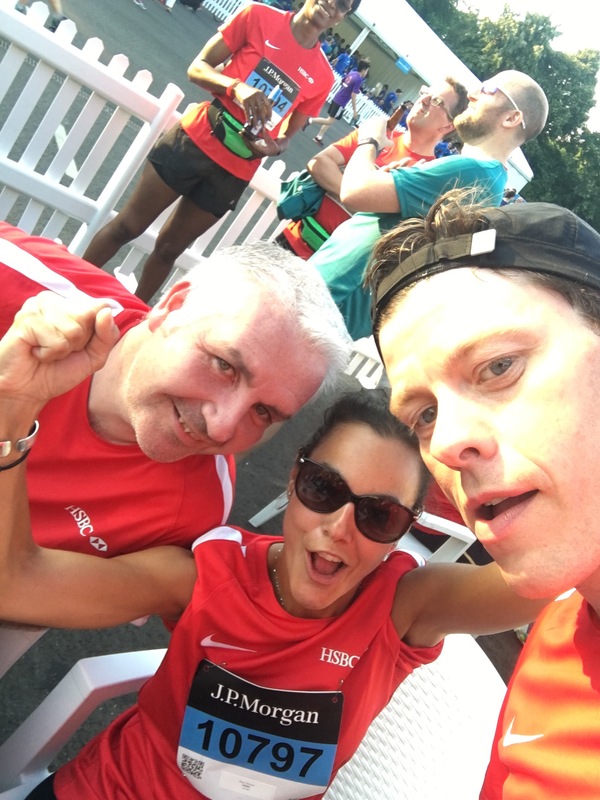 My ‘A’ run race is Rome Marathon and was more of a 2nd option as I managed to forget to pay my GFA entry for London Marathon during celebrating my 40th birthday. End result losing my GFA entry and time, I looked at alternative rated marathons and found Rome and thought why not. December 2015 training was getting back my focus. 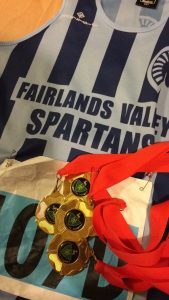 I had been working on my running but it was hit and miss during October and November and in December I decided to enter some races to help focus my mind. The first race was buntingford 10 and the race plan was to negative split. I would build slowly during the race with the aim to go under my previous best time on the course. After some discussions with One of my training partners the initial idea was to race the first few miles over 6 min/m. The race went to plan and I managed to beat my previous best on the course. 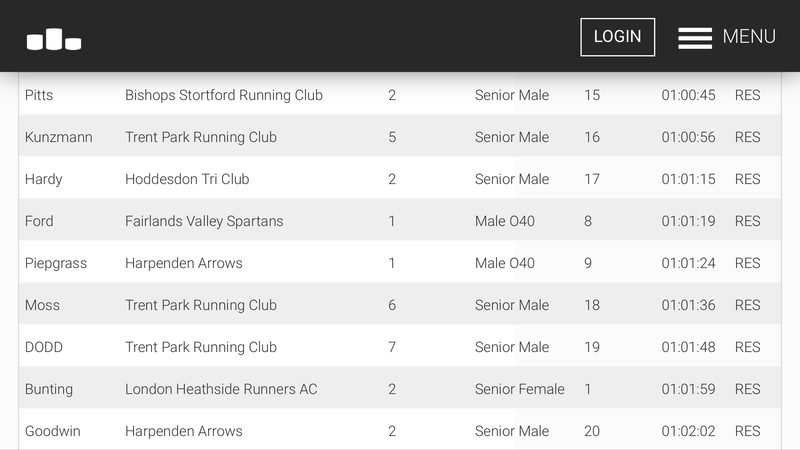 I finished 26th overall and 8th in the v40 in a time of 01:01:19. After failing to complete Ironman Frankfurt my disappointment was to focus on another race. I decided on Monday after the race after discussion with my Wife to head to Wales and use Nirvana to secure a entry using the cheapest possible accommodation. This was based on the fact I needed a year off IM and drop down to half distance for a year and spend some time with the family. 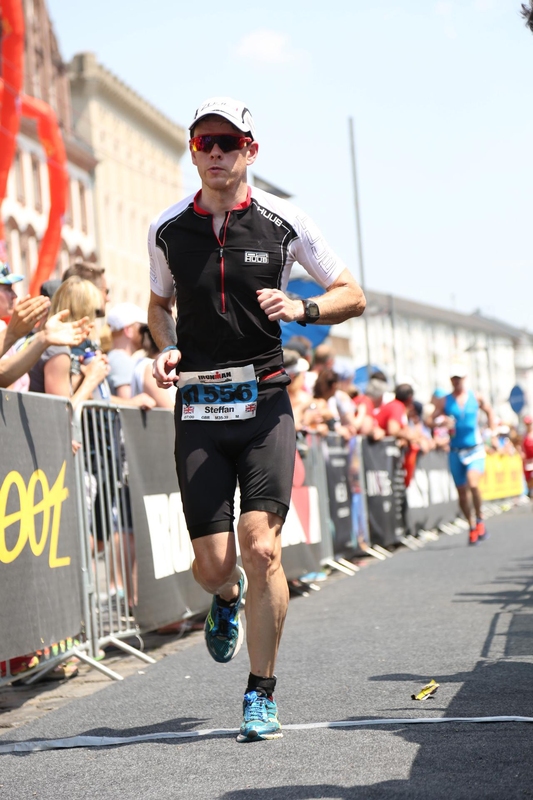 My fitness levels had improved since UK Ironman in 2014 and after my swim and Bike in Frankfurt my thought is too go quicker that 11hrs in Wales. 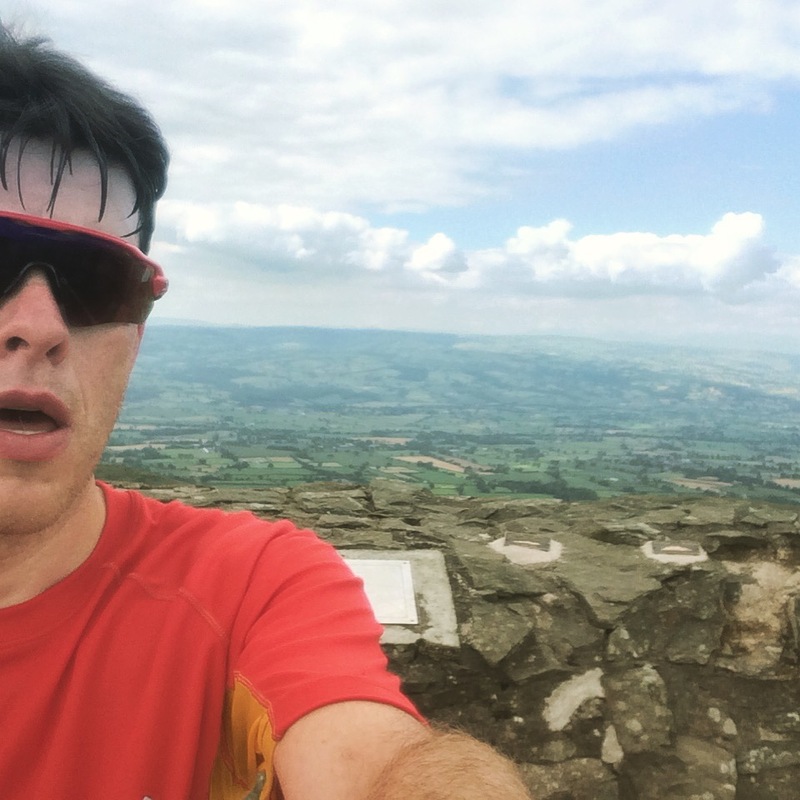 My training has simply to top up on what had previously been done and with the summer holidays in North Wales I can get some hill training around family time. This was an event that I had looked forward too as a team event with the Spartans. We waited until the week before to decide on our A and B teams. The A team was selected through performances in the MWL and recent training. The team included Grant Ramsey, Simon Jackson, Richie Bates, Myself and Craig Halsey. Team Gets Gold Hertfordshire ASA Medals! I planned on racing under sub 10mins and the team was in 4th place overall and I held the place. But annoyingly my 2km effort was slower by 20 seconds and the drop off pushed me above my target and gave me a time of 10:09. The team result was the important aspect of the night and holding 4th overall but also being the top club from herfordshire won the team the Hertfordshire County Championship. I won the race to enter the race and next was to put the planning on place. I booked a room in the Adina Hotel (hotels.com) and got flights from London (BA). 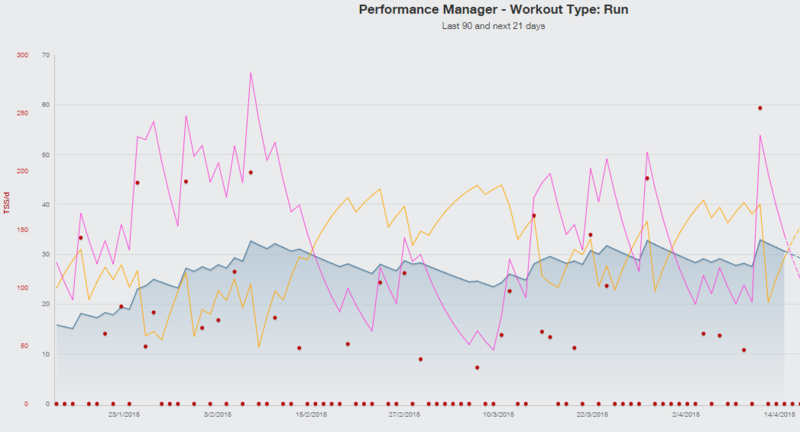 The planning was now in place to focus on Ironman Frankfurt as my A race for 2015. Swim started at front and once out of the crashing legs got I got a very clear swim in open water. Grabbed some feet on 2nd lap but also slowed down by red hats that were in front. I ended up in second wave and the red wave was just random. Once I got out of water I raced to the tent but struggled to get my Huub top on as my upper body was still wet after the swim, I took longed than I wanted in t1 and washed my feet to remove any sand. The last thing to do was to put on the HR monitor and I was good to go. Me feeling at ease on the bike. The bike was a surprise as the power was not reading so then I focussed on keeping my HR under 80% again this is a zone I should have been aware of when power fails. I also went on feel on the bike and pulled back where I felt tired. On the cobbles and hills many passed me and I simply eased back and then focused on the flat. My race nutrition was 14 gels mixed with water and I took this equally over the race time with nothing left. I had a water drink and used the hydration tablet (powerbar). I figured out I was drinking a 1.5 bottles of 750ml water an hour. I also took salt tablets during the race (3 in total) and 2 more hydration tablets. I remember feeling sick on the bike a few times and passed urine twice on the bike. Just before the last hill I ran out of water and was a little dehydrated until I reached the water station this was probably around 5 mins. The run was funny and mentally I had decided to walk each station taking on 2 cups of water / any salt and ice / sponge. The pace didn’t change and I took 2 gels during the first 20k, I also picked up pretzels. When I got to the station after the 2nd counter I started to switch to Coke but started to feel very sick. My head started to feel funny and I realised that I was gone. I stopped took on coke and carried on walking. I tried to run (ha ha 9min/mile) but only felt sick. When I finally arrived Del (my wife) my hands were shaking and my friend who is a diabetic suggested 2 gels and some rest but I was cooked and couldn’t see an end in sight. I suppose some would say I should have carried on but I feel I did the right thing for my body and although I did not finish I have experienced one of the greatest races of my life. 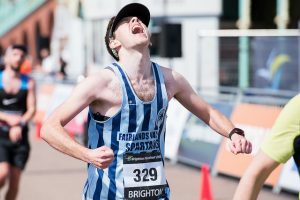 I had a touch of sadness as I realised that with a 4hr marathon I would have easily done sub 10:30 and with a 3:30 marathon I could have done sub 10 that I never thought I had the ability. I will return one day. So what do you do after a disappointment of not finishing a race enter a quick local race! I’ve always enjoyed big cow events and like the layed back nature of the big cow crew. The race was a 7am kick off as the race is not on closed roads. The roads are quiet and you only get to see a few cars. The swim was a little bit different in that I was very laid back instead of sprinting to the first buoy. After passing the third buoy I stated to pass a few swimmers and decided to draft an athelete. This was the first ever time I had an incident in open water in over 7 years of racing. The guy obviously didn’t like me swimming close and decided to take action by pushing me under the water. I was a little put off but decided to ignore the athelete and pushed in front of him and started to kick very hard. Funnily enough I didn’t see him after. I exited the water in 22:10 mins a little slower than normal and probably due to my laid back approach. The bike was wet and a little windy and looking at the bike splits it appears the race was slower due to the conditions. I was looking to push 95% of my theshold power but ended up around 85%. Finishing in a time of 1:06:59. This left me a little fresh for the run. Once out on the run I took the first lap a little easy to build then I pushed on. 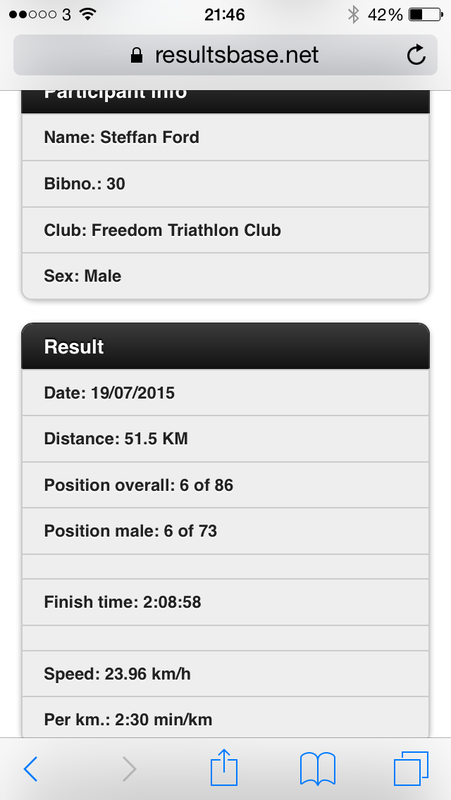 This was probably the best run I’ve ever done in triathlon and felt very strong during the run. In hindsight had I attacked from the outset I would have been closer to a 36 min 10k but I’ll take 38:10. The end result was not a concern but I just wanted to finish a race and I achieved this with 6th overall in a time of 2:08:58. As part of my training plan I had arranged to do the big cow long weekend in Milton Keynes. This was around 3 weeks after Brighton Marathon and a chance to practice the long swim. However, prior to the weekend I had picked up a virus and was on steroids and suffered breathing problems. I decided to sacrifice the swim as this was no place for somebody who had been ill and thought about the long bike the next day. However, the forecast was not kind with high winds and rain and I decided to go out later on my own for a 4hr loop. The final day of the weekend was the half marathon. 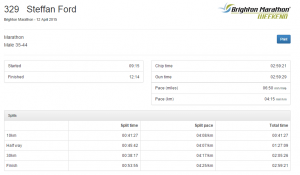 Boom – Sub three hour marathon achieved! The idea to do a full marathon had been in my bucket list for many years. When I had been working for 5 years after university I tried my first ballot for London Marathon (2007). I was unsuccessful in the ballot but managed to get a fine adidas running jacket. After many years of Triathlon I never motivated in doing the long distances until I completed my first half marathon. The experience motivated me towards trying to get London Entry and another failed Ballot and even the club ballot ended in me choosing the wrong soin of the coin. So my first ever marathon at the end of an Ironman and that got me thinking that I could achieve the good for age time for London Marathon. So to achieve this goal I entered the race then checked with the wife if she fancied a weekend in Brighton. I knew immediately what my goal was – I wanted sub-3 hours, this was based on my half-marathon PB (1:18). I could live with missing my target, but not if the secondary goal of GFA for VLM(3:05) was not achieved. My build up to the race was to slowly build the training miles up from my longest run of 10miles (Sept 2014) to 20miles (Mar 2015). This was with my usual tempo and interval runs and IM training plan provided my Russ Cox. The build up included some half marathons and my test race was at Oakley 20 and I knew I was ready to race. However, my injury prior to the race caused some concern but as ever my Physio Kieran Feetham got me to the start line and I can’t even remember my knee hurting post race. The new addition to my plan was removing alcohol and watching my diet in general. My justification was that racing without drinking could add benefits not only on race day but during my training cycles. I simply figured that carrying any excess weight for 26.2 miles was not going to help. 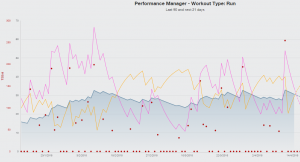 To monitor my progress I often refer to the Training Peaks Performance Chart as this is a good indication of my running form. I was finally ready to race and Saturday was the planned trip to the expo center and pickup my race number. We booked in Crowne Plaza London Gatwick hotel that is actually based in Crawley. I weighed up being in Brighton versus travelling on train, however, In hindsight my choice was excellent as the hotel was in proximity of Three Bridges train stop and trains ran every half an hour. This obviously did’t stop me panicking post race as we got stuck on the M25. My pre-race strategy was to run the race at 6:45 m/m and at mile 20 push if I had anything left. My nutrition strategy was to take a gel every 5 miles as this would be around 35 mins per gel. I used water at most stations to ensure I was hydrated during the race. My pre race purchase was a flip belt (I actually challenged them to see if they’d award a prize for the first racer home in a belt) as I experienced issued with my traithlon belt and gels during training runs. Although untested this felt comfortable when around my waist and didn’t move during the race, I’d love to see an Ironman Race Distance belt. I would rate this belt 10/10. On race day I was up early okay for me(6am). Breakfast was what I always have before a race – a cup of coffee, followed by 2 pieces of toast and a yogurt. I had entered on a Good-for-Age HM time, and was lucky enough to have a place at the Elite start. The facilities have a small area and exclusive portaloo for the International Elite. For the rest of the runners we had exclusive use of a large marquee and around 10 Portaloos (130+ runners I would guess). The lorry to take the kit needed to be packed by 9am and I put on my kit bag. I kept my long top to keep warm and decided to remove before the race started and asked a helper to put in a rubbish (maybe a waste but I suffer in the cold). We are asked to line up at the start at 9:10, but leave 10 metres for the International runners to take their place on the line. At 9:15 we are off! The Elite start at Brighton, has a few benefits one is that no congestion exists except around the 3hr pacer (he had a lot of friends) and it’s downhill until the two packs merge (Elite and Main Race). The race has great crowds and you can feel the energy as you run through banks of people on either side of the road. You come into Brighton on York Place and the crowds in the town are amazing. My first mile is completed in around 6:40 and I’m on the pace set. This continues around the town until I get into mile 6 until we head to Ovingdean. The route is a gradual incline maybe around 4-5% and a group of 4-5 runners form. I tend to run on the front until 2 other runners come and help keep the pace. At each water station I ensure I grab a cup and take a few sips of water. The weather has been much kinder than forecast with a little wind and nice bright sunshine. For the first half I’m feeling pretty comfortable, but as we head downhill into the city centre we can hear the commentators but that was the last thing on my mind as I started to experience some nasty stomach cramps. I asked the helpers for the next location of the portaloo but nobody had the information I desperately needed. I finally found a loo on my third attempt after being sent up the incorrect side of the toilets. To my annoyance the first 2 were closed but to my releief the third was available. The experience cost me a minute in time and maybe a change in my pace as I tried to catch runners around me. I hit the half-way point at around 87 minutes. The next few miles are another out-and-back through residential streets and for me this was an enjoyable section with lots of enthusistic supporter. Many local residents had music playing and a makeshift band was playing some tunes. I ran with another club runner and we were running around 6:45 m/m. However, when we hit mile 20 I got a little tired and for me the most unenjoyable section of the course as it goes into a industrial docks and strong smells of fish make my tummy turn. The section is also not very well supported and I understand why Saucony have the 23 mile films to help motivate runner. This was very motivational as my daughter Beca made a film (Catrin made a film for her medium friend – Gareth). At mile 23/24 my pace was dropping at around 6:55 m/m and I felt my hamstring and calfs cramping. Then disaster the 3hr pace maker caught me in mile 25. I was caught by surprise and thought no dig in otherwise the time will simply disapear. I dug deep and followed the pacer as he motivated the 4 runners around him. My plan was to leave 2 x 7:30 m/m for miles 25/26. The reaction was to increase my pace but then I started to cramp badly so I started to do walk/run technique for 50m. This eased the cramping and I continued to get back to a pace that felt controlled. This unfortunate timing then forced me to consider were my calculations incorrect. When I glanced at my watch and on mile 24 I had around 2:43:something. So best case scenario is 17 minutes to run 2.2 miles. I left the pacer go and thought if my maths and watch are correct I can achieve my target time. The crowds are getting noiser as we head towards the end. Many are shouting “nearly there”, “go go you can do this!” and more importantly “you can get sub 3 hrs”. Finally the 400m to go, I can see the line but can’t read the clock as I get closer is it saying 2:58 or 2:59 something am I too late ! The commentator is geeing the crowd as the runners still can achieve 3-hours, I muster a final sprint down the finishing straight. I look up I can see the finish line and the clock and can only explain my emotion as uncontrolled feeling of achieving something very special. I head through the end congratulating the runners around me and get chatting to a runner from Flitwick who is also an Ironman. Its time to collect my medal and t-shirt, and head off to find my family as I say my goodbye. The girls give a a big hug and my wife is proud of her husbands achievement (this can be translated to thank heaven I don’t have to listen to a moaning husband all the way home and for the next few weeks). The final hours of the weekend are to support those to shared my journey to Brighton (Anna, Yvanne and Gareth). Now to focus on my up and coming Ironman in Germany (European Championships). Finally, a few post-race thought and some tips. Follow a plan and keep to the detail you’ve worked out. Book a hotel away from the centre. My friend had no sleep as this is a very busy city at night. Try out your gels in training and ensure you have a comfortable gel belt that does not move. I would not recommend a triathlon belt. Many thanks to my family support team and my running club for those enjoyable training runs. Is it a serious sports injury ? So my race was over before it had started, I turned up to Stevenage Sports Clinic with the thought that if my physio advised me not to run then I would follow his advise. As ever Kieran went through the last weeks and focused on aspects I had not even thought about such as work shoes. Kieran identified the issue very quickly linked from my feet to my hip flexor and then worked on the area of concern. The news at the end of the consultation was a very happy moment – your all ready to race and good luck. As an athlete I tend to jump to conclusions too fast and need to follow the advise of those who are qualified. My final big run before Brighton was to attend Bedford Harriers Oakley 20. The race plan was to run as sub 3hr marathon pace. Therefore, based on the sub 3hr I worked out that I needed to run mile splits at under 6:50. Using the data I set my Garmin to 7:10 max to ensure I kept the pace. At the time this seemed an excellent idea but at mile 18 when the legs began to get tired hearing the garmin (beep-beep) became very annoying indeed. The weather was typically British and high winds and rain was the order of the day. The cross winds were very challenging and added another dimension to the tough course. At the start I noticed some groups of runners form and I found the pace with a group of 4/5 runners. In hindsight this wasn’t really running to the plan. I soon realised that the course was very hilly and not very good for a pacing practice. I carried on with the plan to run sub 6:50 and this went to plan until mile 17 when the legs became very jaded. 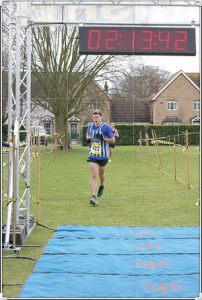 I had taken 3 gels during the period and was convinced it was simply the legs that couldn’t keep going at the pace and I concentrated on completing the last 3 miles without losing too much time.